The leader of a Pakistani Islamist militant group has been killed by a suspected US drone attack in Afghanistan, its spokesman says. Omar Khalid Khorasani led Jamaat-ul-Ahrar, a faction of the Pakistani Taliban behind several high-profile bomb attacks inside Pakistan. Nine other militants were killed alongside him in the drone strike, the group's spokesman said. Local media report increasing numbers of drone attacks in the past week. Nearly 40 people, many of them suspected militants, have been killed along the border. 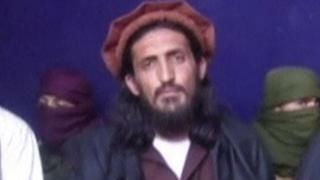 Khorasani's death comes ahead of a visit to Pakistan by US Secretary of State Rex Tillerson. Analysts say Islamabad has been urging Washington to target militants who attack inside Pakistan and hide over the border in Afghanistan. It also said it was behind the suicide attack on a hospital in Quetta that killed at least 74 people. There were rumours in recent days that Khorasani had been injured during US drone strikes along the border, and Thursday saw his group confirm his death. "Chief of our Jamaat-ul-Ahrar Omar Khalid Khorasani, who sustained serious injuries in a recent US drone strike in Afghanistan's Paktia province, succumbed to his injuries Wednesday evening," spokesman Asad Mansoor told AFP news agency by telephone. He confirmed the news when speaking to Reuters news agency. Jamaat-ul-Ahrar pledged allegiance to the Islamic State group in 2014 but a year later said it had rejoined the Pakistani Taliban, which is allied to al-Qaeda. Khorasani was seriously wounded in a Nato air strike in eastern Afghanistan in 2015 but recovered from his injuries.